According to the Committee to Protect Journalists, 45 journalists have been killed delivering the news to the world. Before hearing about the film A Private War, I had never once heard the name Marie Colvin before. Now I’m an avid news follower, and a woman with a story as extraordinary as this would be sure to stick in my memory. But nevertheless, I had never heard of her. Upon watching this film, I felt almost ashamed that I was just learning of her. Not necessarily ashamed at myself for my lack of knowledge, but ashamed that society hadn’t given her and other journalists who have died doing their job more recognition and notoriety. A Private War focuses on the career and personal life of war correspondent Marie Colvin (played by Rosamund Pike), as she dives head on into the throngs of conflict to capture the truth and give a voice to the voiceless in trying times. In 2001 during an encounter with the Sri Lankan army, Marie lost complete vision in her left eye from a rocket-propelled-grenade, all in the name of journalism. Despite this event, and ongoing trauma from her experiences in war torn areas, Marie continued to be front and center in these wars and deliver the stories that only the bravest of souls could deliver. It is stories like these that make movies exciting and genuine because of how eye opening to reality they are. A Private War, and other films of true story nature, opens the audience’s eyes to a world they may be aware of, but one they don’t truly know themselves. They create a sense of compassion and empathy, and hopefully new eyes as to how they see certain injustices in our world. Rosamund Pike portrays a headstrong, yet troubled woman who no matter how much she is knocked down gets back up tenfold. She portrays a heavily guarded woman with a rocky past (trouble with an ex, miscarriages, alcoholism) who deals with war not only in her work life, but her own personal life as well (hence the name of the film). She delivers an extraordinary performance for such an extraordinary story. In the film Pike states, “I hate being in a war zone, but I almost feel compelled to see it for myself”. It is this quote that truly defines Marie Colvin, demonstrating the pain and loss going to war has caused her, yet the determination to get back out there and share the story of what she sees with the world. I have a complete newfound respect for reporters on the frontlines of war, soldiers in their own right. 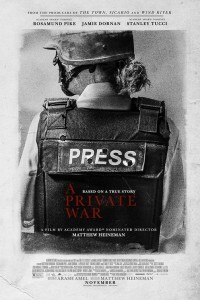 A Private War is a reminder, and even a lesson in the value of free press, that sometimes the truth can come at a heavy cost. By Tim Nasson Let me make one thing clear, OK, two. First, Ryan Gosling is a great actor.